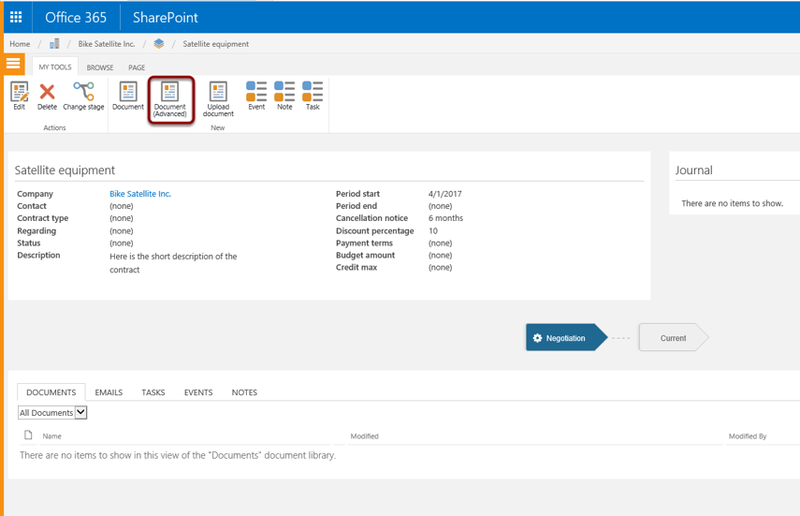 Setting up document set templates in WorkPoint365 – Welcome! How can we help? 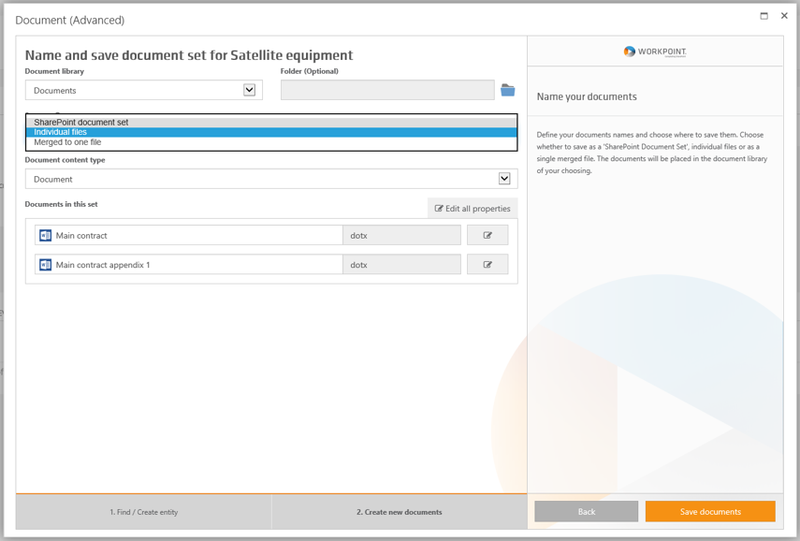 This article describes how to set up document set templates in WorkPoint365. 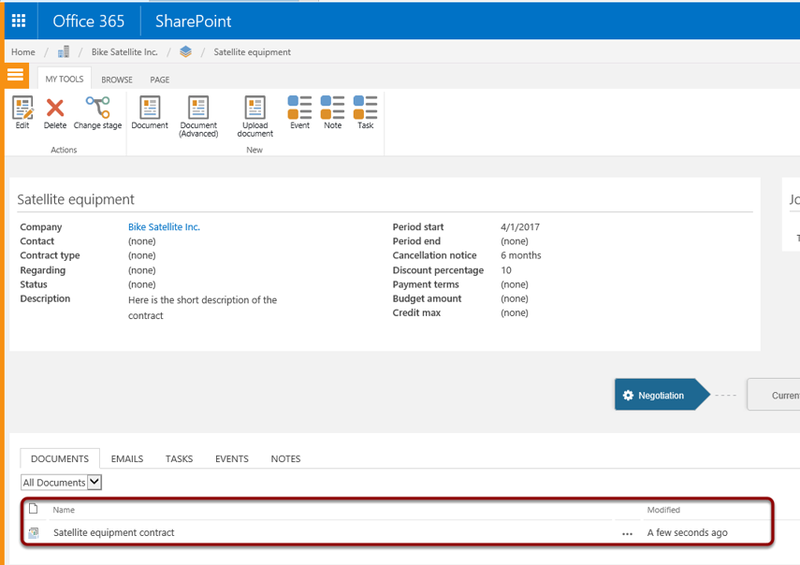 The WorkPoint365 document set feature is using and enhancing SharePoint's document set feature. 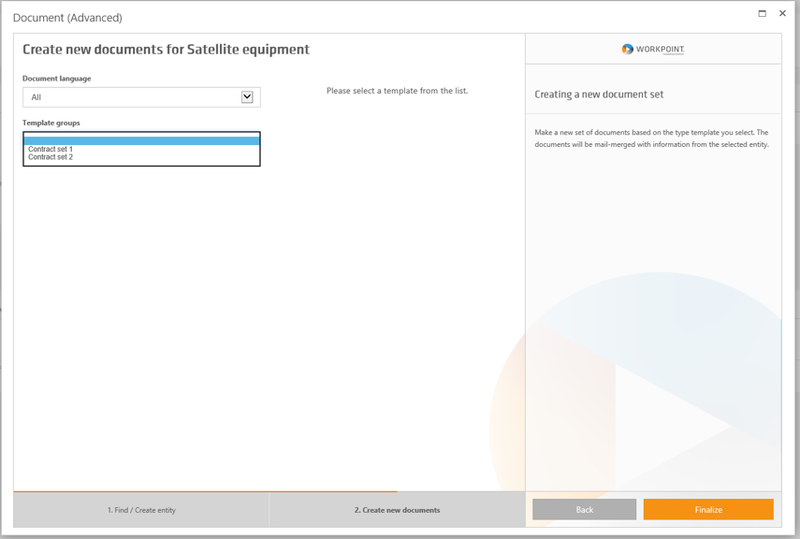 Before attempting to set up document sets, be sure to understand how document templates works in WorkPoint365 (see other guides on this page). To manage template sets, we use SharePoint managed metadata for setting template groups. 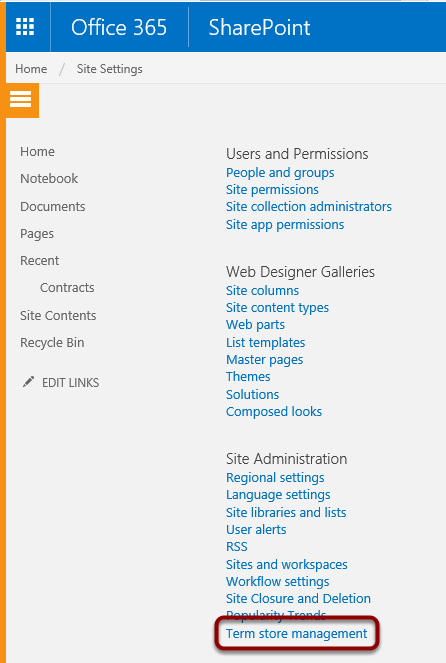 Click on the cog wheel to the top right in the browser and click "Site Settings"
Now click "Term store management"
In my term store management, I set up a set of terms under the site collection where WorkPoint365 is installed. Here I have made two contract sets. For this example I will work on "Contract set 1". 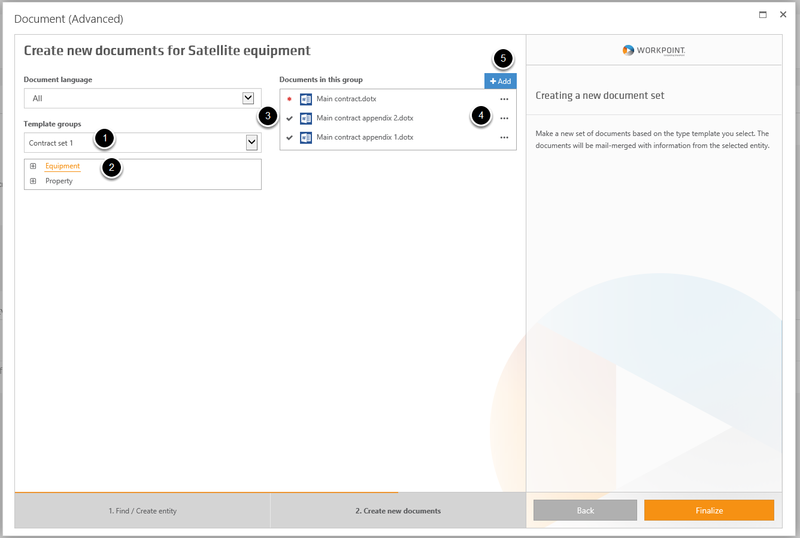 In the template library we have created three contract documents, a main contract plus appendices. For information on setting up document templates, please see the guide describing this. 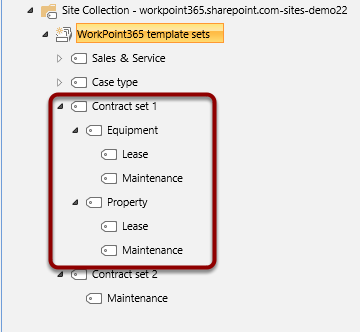 Click the edit button to edit the properties for the templates. Clicking the label icon opens the dialogue box allowing me to add more tags. I add "Property" and "Lease", to use this contract for these situations. The "Required in template sets" property determines in which situations this template is required. The "Template languages" property is used to filter templates when the user is choosing templates - the user can choose to see templates in a specific or all languages. Click "OK" and "Save" to save the template properties. 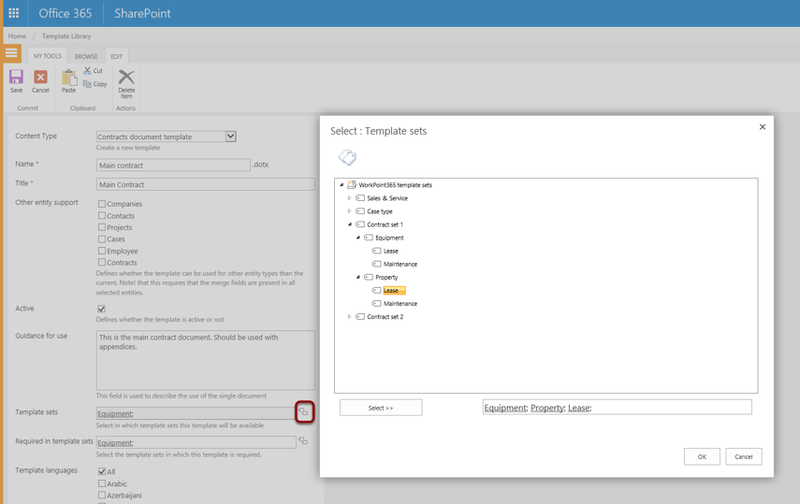 For document sets, you need to set the three lowest properties; "Template sets", "Required in template sets and Template languages". This main contract is for use in "Equipment and required in "Equipment". It is a accessible in all languages. 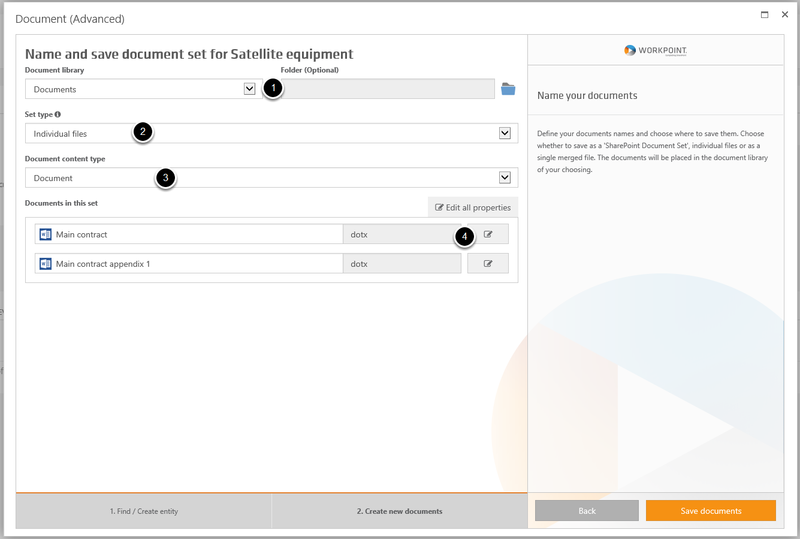 The idea with WorkPoint document sets is to make it possible to set up flexible document sets, allowing the user to include or omit documents in the sets, as well as add new files on the fly. In this guide we use the example of a contract with appendices. The first step of the wizard let me filter my available templates by language (I have left it at "All") and then pick the template group. 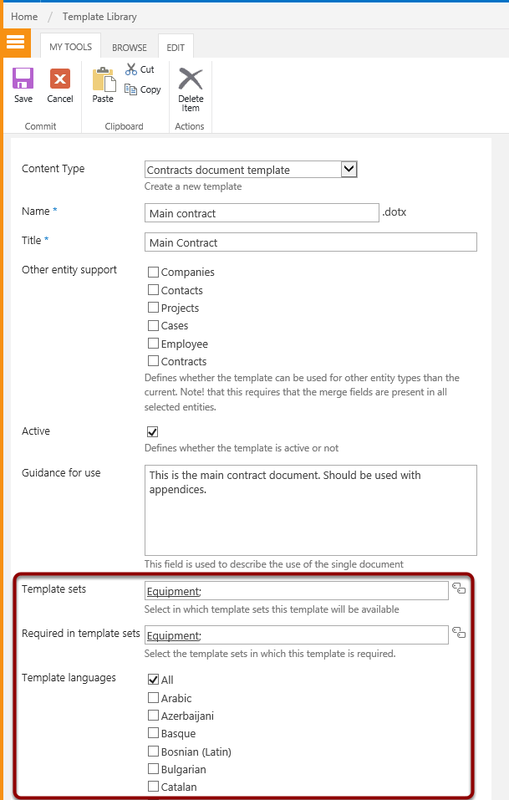 Remember from step 3. above, that on the contract module we had set up two groups, contract set 1 and contract set 2. 2. Equipment and Property, which I should, looking back at step 3 again. 3. Note the red dot indicates that Main contract is mandatory here, while the appendices are optional. This reflect my choice in step 5 where I set "Main Contract" to be mandatory in "Equipment". Click the tick next to the document to deselect it. Click again to reselect. 4. Clicking the three dots will allow me to search the system for previous uses of the particular template and add the document to the set. 5. Or I can click the "+Add" button and search for other document across the system - useful when you want to use your colleagues perfectly phrased document from last week. I deselected appendix 2 and clicked the "Finalise" button and here I am. 2. Select how to store the set. 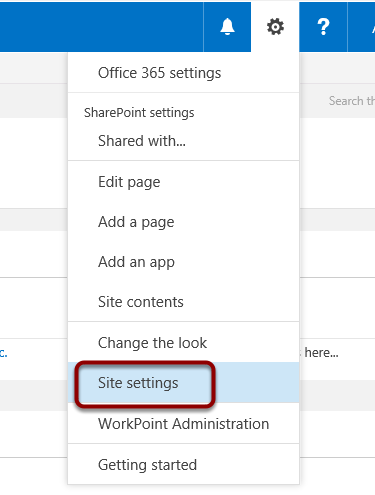 As "Individual files", "SharePoint document set", or Merged to one file"
I choose SharePoint document set, provide a name and click "Save documents"